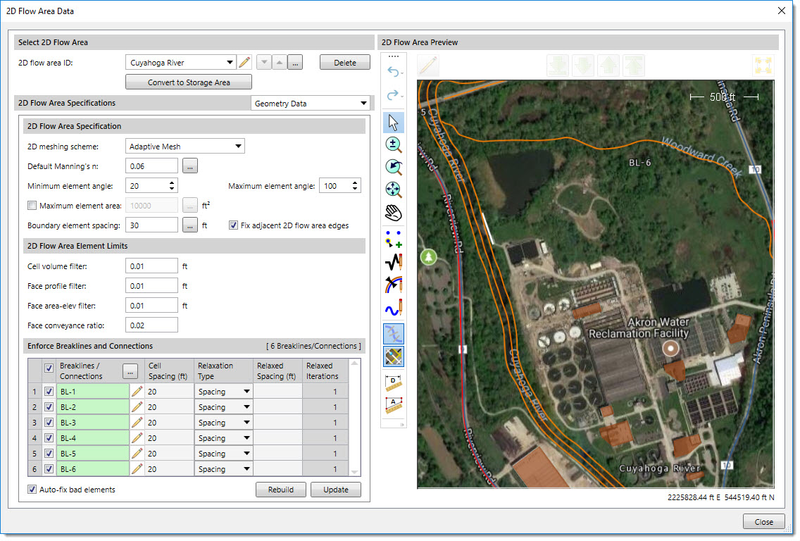 The above concerns are automatically handled when using a 2D model. There are many bridge modeling situations that are effectively managed with a 2D model, but that would be problematic with a 1D model. 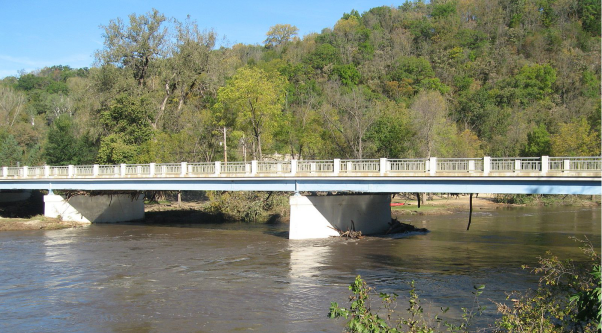 For example, modeling of skewed bridges can cause additional energy losses and increased water surface elevations, conditions that would not be part of the analysis using a 1D model. Once the bridge pier has been defined, the user can interactively move and rotate the piers to place them at the correct locations in the bridge opening. Then, the software will update the 2D mesh to incorporate the bridge piers into the mesh geometry. From the Input ribbon menu, select the 2D Flow Area Data menu item. The 2D Flow Area Data dialog box will be displayed. 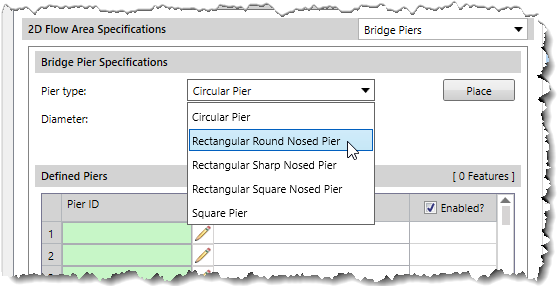 From the dropdown combo box panel selector, select Bridge Piers. The Bridge Piers panel will be displayed. 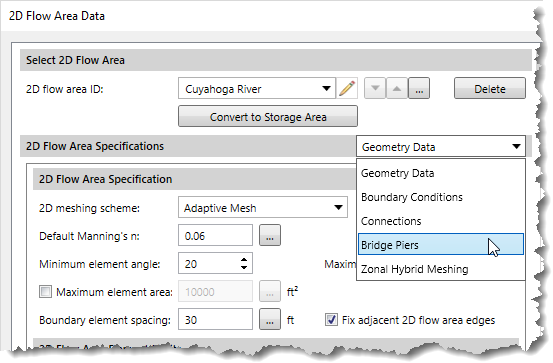 From the Pier type dropdown combo box entry, select the bridge pier type to be placed into the 2D mesh. 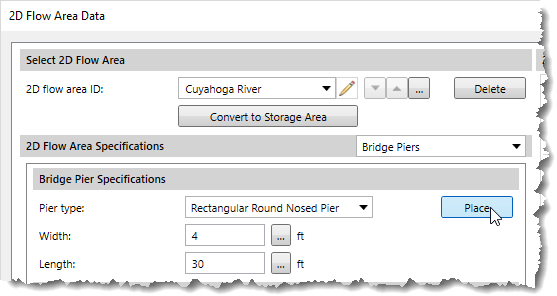 Define the pier dimensions (diameter or width and length) that are to be used—based upon the bridge pier type selected. The software will place the defined pier in the center of the 2D Flow Area Preview window. 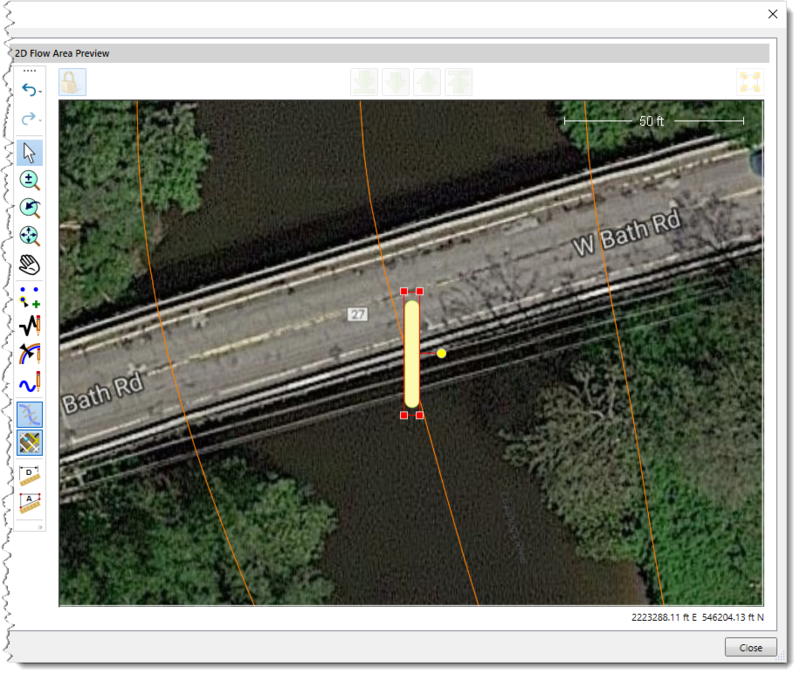 Click on the bridge pier structure and then drag the pier to the correct location. The rotation handle can be used to rotate the bridge pier around its center point. 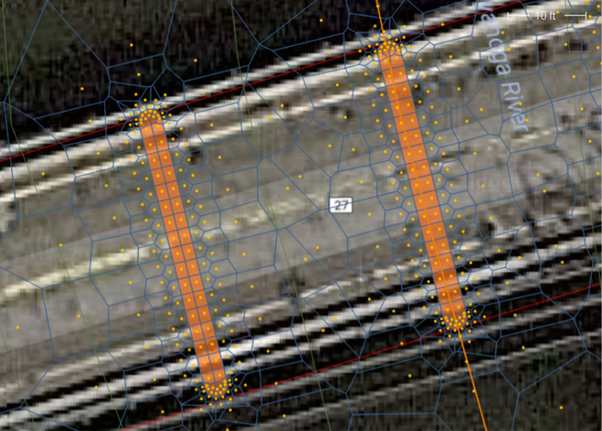 After the bridge piers have been placed into the 2D flow area mesh, click the [Update] button. 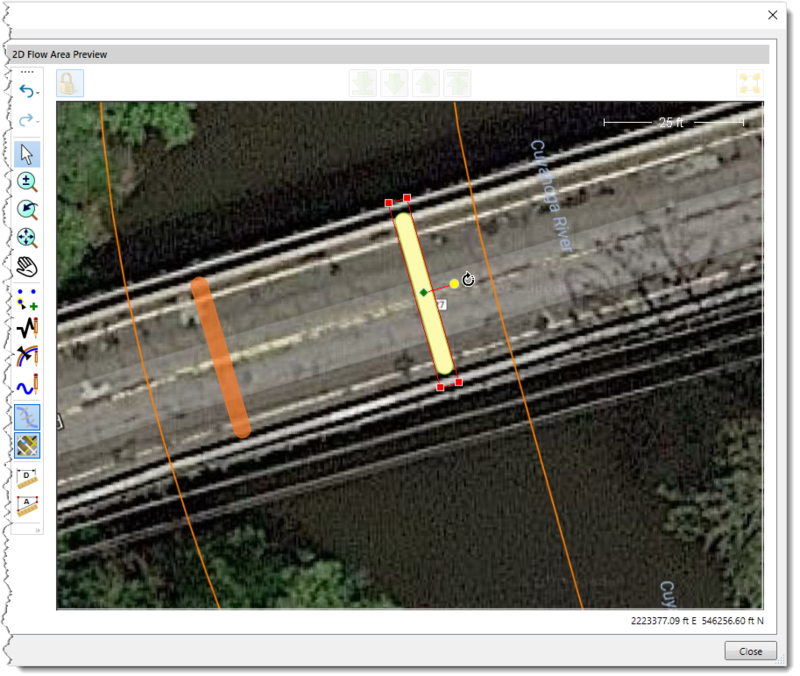 The software will then incorporate the bridge piers into the 2D mesh. 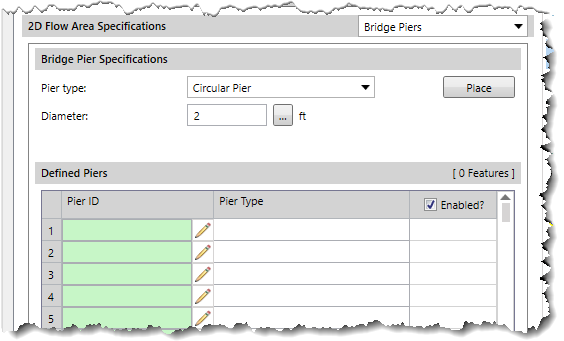 The Defined Piers data table lists the bridge piers contained in the 2D flow area. 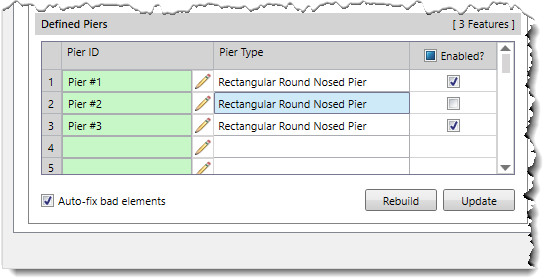 It includes the pier ID (name), pier type, and a checkbox to enable or disable a pier. To temporarily remove a pier from the HEC-RAS 2D computations, uncheck the Enabled checkbox corresponding to the pier.